Sorry for the delay in posts. I am presently sitting at a table in a McDonalds hoping my internet is back up soon! Anyway, our next review item for the Baby Shower Event is the Vick's Behind Ear Gentle Thermometer. I am going to tell you right now, this was a big hit with our mom to be. She even had to use it the day after the baby shower on her mom! Her mom knew she had received it as a gift and when she couldn't find her own she tried this one out! It works GREAT! The Vick's Behind Ear Thermometer is perfect for new moms and anyone else. I remember the old days of using a rectal thermometer on babies. Shortly after that we went digital, not a bad idea if you can keep your infant still long enough for it to register. And what about just wanting to check on them during the night after they have been sick and you don't want to disturb their sleep? 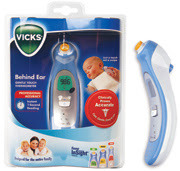 In steps Vick's Behind Ear Gentle Thermometer. Gently place the tip behind the ear, push the button and listen for the little beep. You are done. No hassle, no pain, and your child can actually sleep through you using the Vick's Behind Ear Thermometer. Clinical Accuracy—Based upon professional standards. reading in just one second. No-fuss measurement—Requires just a touch, not a swipe. your child has a fever or not. A GREEN display means no fever. A YELLOW display means the temperature is slightly elevated. A RED display signals a fever. Memory system—Tracks and saves the last 8 measurements. Easy-to-read—Designed with a large LCD display. Built to last—Backed by a lifetime warranty under normal use. You will find the thermometer at Walgreens, Walmart, Target and other stores with a suggested retail price of $30-$49.99. What a SUPER gift this will make for an expectant mother! Any mother for that matter will appreciate receiving a gift like this. One neighbors will receive a Vick's Behind Ear Thermometer. Hurry up and enter! I use a cheap rectal themometer from The First Years, I believe. We use an old fashioned oral thermometer. We use a digital but have been wanting one of these. So much easier. We have one that we use on the forehead. We have an old small digital thermometer. I have a digital thermometer, thanks for this giveaway! Yeah, I use the palm of my hand. We need a thermometer that's more scientific than that! We have one of those digital stick ones that literally takes five minutes to read my child, and you can imagine how tortuous that can be for a child to sit still that long when they are not feeling well! Thank you for the giveaway! I have a digital oral thermometer but would love one like this! Right now we use a oral digital thermometer.